Forget glitter, Trish added sparkle to her mantel by creating lighted paper mache letters. This fun project is the perfect finishing touch for her Christmas mantel and you might have to steal a page out of her playbook to create something fun for your mantle too. 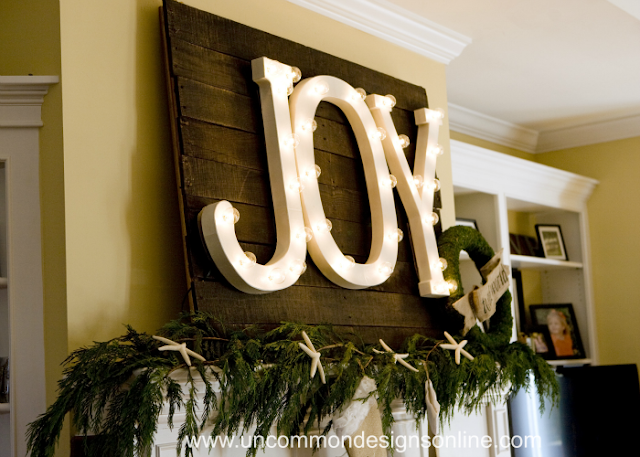 You can check out Trish's Joy to the World Christmas Mantel over at Uncommon Designs. Some people are so clever! This is a really neat idea and so pretty too! Thank you so so much for sharing my mantel! Hope all is well in your neck of the woods!